Home SharperIron Forums Principles & Consequences Front page article archive Who First Adopted Individual Cups as a Regular Communion Practice? Who First Adopted Individual Cups as a Regular Communion Practice? On Sunday morning October 7, 1894, parishioners filled the Bedford Avenue Baptist Church of Brooklyn, New York, in anticipation of experiencing what The New York Times termed a “novelty in communion service” (October 8, 1894). Two newspapers had announced in late September that this church would implement individual cups. The September 28, 1894 issue of The Brooklyn Daily Eagle quoted Bedford’s pastor, J. H. Gunning, as saying that the cups would be used at the next communion service. However, attendees who arrived expecting the individual cups “were disappointed” to see the same old six silver goblets (The New York Times, October 8, 1894). After the service, Rev. Gunning called a business meeting during which he said he was anxious that his church be the first in Brooklyn to use individual communion cups. A majority voted, by standing, to purchase 200 three-inch tall silver cups lined with gold at a cost of thirty-five cents per communicant. Up until the 1890s, Protestant churches throughout the world used common communion chalices. Some used just one, while others were known to use several in order to administer the fruit of the vine in a time-saving manner. However, churches using multiple chalices still had tens or perhaps hundreds of people sipping from the same cup during a communion service. In the late-nineteenth century, when outbreaks of diphtheria and tuberculosis were common, American sanitarians agitated to reform this religious practice—though no disease contraction had been linked to the use of a common communion chalice. Reformers proposed several alternatives such as intinction, individual fistulas or siphons, scalloped-rim chalices, and disinfectant cloths. However, among all proposals, individual cups emerged as the most popular method. Enough pastors and laymen became convinced of the sanitary need to use individual cups that the idea took hold, then rapidly spread into the twentieth century. This reform changed what was believed to be an almost 1,900-year-old method. Late-nineteenth and early-twentieth century newspapers, religious periodicals and medical journals attempted to identify the first church to enact this unprecedented reform. 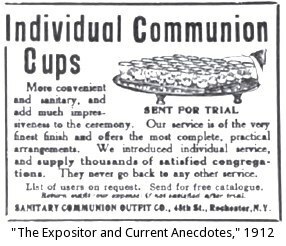 In this clamor for notoriety, at least seven churches publicly claimed or were bestowed with the distinction of being the first to use individual communion cups. Some of these conflicting claims have also appeared in books, articles and websites in the late twentieth and early twenty-first centuries, which evidences a persistent lack of consensus on the matter of first use. This article presents conflicting first-use claims and identifies which of the public claims represents the earliest use of individual communion cups. However, an earlier claim is also documented. According to the May 14, 1894 Rochester Democrat and Chronicle, the elders of Central Presbyterian Church of Rochester, New York, appointed their pastor, Rev. Dr. H. H. Stebbins, and fellow elder and physician, Dr. Charles Forbes, to “design a plan for individual cups” at the urging of the Rochester Pathological Society in early 1894 (p. 9). The same article reported that a plan was devised and Central Presbyterian first used individual cups on May 13, 1894. A few months after this service, the Rochester Democrat and Chronicle stated that “Central Presbyterian Church…has the distinction of being the first church in the world to adopt the use of the individual chalices in the celebration of the Holy Communion” (September 24, 1894, p. 8). Dr. Forbes went on to found the Sanitary Communion Outfit Company. An early twentieth-century advertisement for his company (pictured at the beginning of this article) appearing in The Expositor and Current Anecdotes claimed, “We introduced individual service…” (October-December 1911; January, February, April, June, & July 1912). Central Presbyterian used individual cups in the spring of 1894, but were they really the first that year? When the Rochester Democrat and Chronicle reported on Central Presbyterian’s seventy-fifth anniversary as a church it stated that Central’s Pastor Stebbins “had inaugurated the use of the individual communion cup which has spread throughout the entire world,” but it also mentioned that some of the cups ordered for Central’s first individual-cups communion service were used “as a preliminary test” the previous Sunday morning at North Baptist Church of Rochester, New York (November 11, 1911, p. 17). This service took place on May 6, 1894. About nine months later, North’s pastor, Rev. G. F. Love, wrote in the New York Evangelist, “My church was the first to use them [individual cups] and it will be the last to give them up” (February 21, 1895, p. 28). About a year after North’s initial use of the cups, a statement appeared in The Journal of the American Medical Association (JAMA) made by Dr. H. S. Anders—a Philadelphia physician who promoted individual cups—which claimed, “The first church in Christendom, so far as known, to adopt this modification was the North Baptist Church of Rochester, N.Y., at the communion service held May 6, 1894” (June 8, 1895, p. 890). A couple of years after making his statement about North Baptist, however, Dr. H. S. Anders made conflicting statement in JAMA which claimed, “So far as our knowledge extends, the first church to use individual communion cups for sanitary reasons was the First Congregational Church of Saco, Maine, in November, 1893” (October 16, 1897, p. 792). In the Outlook, two people from Saco—one a deacon—wrote to the editor that their church first used individual cups in January 1894, not November 1893 (April 14, 1894, p. 680; June 2, 1894, p. 980). This coincides with a report in the Lewiston Saturday Journal (Maine) which cited a Boston Congregationalist article stating that “At the January  communion of the Saco church individual cups were used…” (March 10, 1894, p. 2). Evidence points to an even earlier date for the first use of individual communion cups, though. According to A Standard History of Allen County, Ohio, John G. Thomas—a physician and pastor of the Vaughnsville Congregational Church—designed a communion outfit after noticing “a communicant with a diseased mouth condition” (p. 288). Thomas applied for a patent for his invention on August 2, 1893, in which he wrote that he “invented certain new and useful improvements in communion service” which would “provide an individual or separate cup for the use of each person at the celebration of the Lord’s Supper, commonly called the communion service…” (Serial No. 482,186). According to The Lima News, Thomas and his church elders first experimented with the individual cups “sometime during 1893” (January 16, 1955, p. 5B). The patent for his invention was granted on March 6, 1894, and marked the first time an individual cup service received letters patent in the United States (Patent No. 516,065). 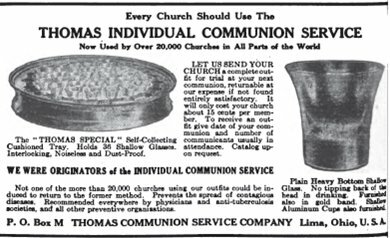 An early twentieth-century advertisement (pictured right) for the Thomas Communion Service Company appearing in the Methodist Review claimed “We were originators of the individual communion service” (May 1914, p. 506). But Vaughnsville Congregational’s claim to have been the first users of individual cups appears to be incorrect as well. When Centennial Methodist Church of Newark, New Jersey, implemented the use of individual cups for the first time on March 3, 1893, it enlisted the help of Rev. Dr. E. W. Ryan, pastor of First Methodist Episcopal of Ypsilanti, Michigan. At the time, the Utica Weekly Herald (New York) claimed that Ryan had “started the [individual cup] notion” at his Ypsilanti church (March 12, 1893, p. 11). According to a former Methodist Librarian at Drew University, Ryan became pastor of this Ypsilanti church in 1892 (November 18, 2010 e-mail from Jennifer Woodruff Tait). Therefore, this Ypsilanti church first used individual cups some time after Ryan’s arrival in 1892, but before he assisted with Centennial’s service in March of 1893. However, documents reveal one more first-use claim. In 1892, Alfred Van Derwerken—a lawyer in Brooklyn, New York—sent Brooklyn pastors a paper he wrote titled “The Sacramental Cup.” The Brooklyn Daily Eagle reproduced this paper which urged pastors to provide “as many small cups as there are communicants…. for each person to drink from a cup no one else had used” (December 1, 1892, p. 10). In responding to criticism for proposing this reform, Van Derwerken defended himself in the same newspaper by saying, “This opinion of mine regarding the use of many cups at a communion service…. is in operation in the West” and proved his point by presenting a letter he had received from Rev. H. Webb, pastor of Scovill Avenue Methodist Church of Cleveland, Ohio. In the letter, Webb wrote that he believed his church’s first use of individual cups on December 6, 1891 was “absolutely the first time or case where it has been thus served” (December 2, 1892, p. 2). Reports in December 1891, in both The Brooklyn Daily Eagle and the Utica Morning Herald, stated that the Scovill Avenue Methodist Episcopal Church of Cleveland first used individual cups on December 6, 1891. These two reports also detailed that some of the cups “had to be washed” during the service because the number of people who attended outnumbered the seventy-two available cups. This first use by the Scovill Avenue Methodist Episcopal Church marks the earliest publicly recorded date of individual communion cup implementation. Despite Rev. Gunning’s desires in the fall of 1894, Bedford Avenue Baptist of Brooklyn could not have become the first church in Brooklyn to use individual cups, even if they had been used in October as originally planned, because Wesley Methodist Episcopal Church of that city had already implemented the reform on March 4, 1894 (The Brooklyn Daily Eagle, March 14, 1894). On the national level, the Scovill Avenue church had begun the practice more than two years earlier. The above timeline charts the dates of some of the first uses of individual communion cups in the late-nineteenth century. Perhaps readers know of earlier, but less publicized, uses of individual cups that should be included in the timeline. Found this bit of history fascinating. I knew believers hadn't been using these little cups forever but had no idea when and how (or why) the change came about. I was thinking the other day how from a "green" standpoint (not that I consider myself a "greenie" ..) that the old glass cups were more environmentally friendly .. laugh .. as they didn't hit the landfill .. Then thought about how other churches use a common chalice . Amazing that the individual cups came about as late as the 1890's .. it doesn't seem all that long ago in terms of history.. Though it almost seems like a giant marketing concept that went viral... laugh.. When did they begin to use Welch's instead of (was it alcoholic wine before?)? When did the pressed communion wafer (unsure what food group this is) or the oyster cracker come into use? I haven't done much research on the changes that have been made to the communion bread, so I probably shouldn't venture to answer your question about wafers, crackers, etc. I was actually thinking about this last week, when we had communion. Is it possible to buy the little cups in glass so that we don't have to throw them out? I was in a church that had glass cups, it is possible. On another note, though, how unifying is it for everyone to drink from mini-cups and eat a mini-piece of bread individually? Was that how the Lord's Supper was originally instituted and practiced? What ever happened to the Agape Meal, which accompanied the Lord's Supper? My church practices weekly communion. We dismiss the congregation row by row to come forward and receive communion from two deacons/elders holding bread and two deacons/elders holding chalices of wine. There are also individual cups, some of which hold grape juice, and some gluten-free wafers. This takes about 15 minutes. It took some time to adjust, but I very much appreciate doing it this way. The length itself underscores the importance of the sacrament. It gives time for reflection and prayer. Watching my fellow church members receive the sacrament binds my heart towards them, reminds me of our unity. The gospel message of communion is anticipated throughout our liturgy, so that if feels like the natural consummation of the worship service. Wafers? You don't use matzoh? The Last Supper was Passover; it's supposed to be matzoh. Was that how the Lord's Supper was originally instituted and practiced? That was the first thing I thought. I guess I always assumed they had their own cups at the meal. Anyone familiar with Jewish customs of the time? Never mind. I've just consulted the DaVinci painting. They all had their own cups. ...who invented the deep plates with the holes to hold all the little cups. You could order little glass cups to use instead of the plastic cups, although they can get rather pricey - $43.95 for a pack of 20 glass cups that fit into the standard communion trays. For Jim, in addition to the glass cups they have a "Wonder Washer" that washes 39 glasses at once that you can purchase for an additional $53.95. Here is a link where you can check them out. "a cup" / "the cup"
They broke one loaf of bread and distributed it. It seems he took one cup and shared it. 1 Cor. 10 talks of "the cup of the Lord", too. My main problem isn't so much the cup and the bread symbolizing unity (by being a loaf and a single cup). My concern is more with the meal aspect. How much Last Supper / Meal experience do you get from a thimble-sized cup and a miniscule portion of bread? http://www.fundamentallyreformed.com/2006/09/22/snack-or-feast/ The Lord's Supper — Snack or Feast? Fascinating about the origin of the little cups, but I wonder if that shouldn't raise a flag that the whole concept of an individual experience of the Lord's Supper, in your pew, just you and God, isn't part of American revivalist individualism gone wrong? Bob, I don't think it was done with the primary motivation being "individualism," but rather for sanitary reasons. It's one thing, IMO, for 12 people who know each other very well, and have been like family for 3+ years to drink from the same cup. But I am not going to share a cup with 100+ strangers. Or even 1+. The mind boggles at the number of infectious diseases that can be transmitted through saliva. Ick. I think the public health theory is a good one. I have the same questions/concerns as Bro. Hayton as to why the shared meal aspect has been done away with. Henry Ford, bless his heart, was a genius, but way too many things in American culture resemble the assembly line. It's hard to tell from the pictures, but in the patent applications for both Forbes' and Thomas' individual cups they detailed that their trays had holes to hold the cups. One invention that quickly became a necessity was holders on the backs of pews. Some churches collected the empty cups immediately after they were used, but others waited until the end of the service. An article about the All Souls' Universalist Church in Brooklyn, NY, said that "Pew rack holders for the cups had not been provided and many of the cups fell on the floor. This is a matter that will be attended to before the next communion service." Bob raises some of the concerns that surfaced when individual cups first came into use. One of the solutions to the unity question was to have everyone drink from their individual cup at the same time. The previous practice, whether people went up to the rail or received the chalice in the pew, was that everyone drank when it was their turn. With individual cups the practice of everyone drinking simultaneously came into use as a means of answering the unity argument. The other argument against individual cups was that the Bible used the word "cup" not "cups." Some churches had already been using multiple common chalices and then they ironically tried to argue that the Bible spoke against individual cups. They figured as long as the cups were being shared, regardless of how many there were, that they were doing what was right. Others argued that it didn't matter what was in the cups (wine or grape juice) nor did it matter if individual cups were used, but that it was important for Christians to participate in communion and do so with sincerity. They claimed that people could not participate sincerely or with enjoyment when they were concerned about catching an illness or disease. The argument often made was that the Bible did not prohibit individual cups; therefore, they could do whatever they wanted. I have to admit that I was a little weirded out from the same thoughts about shared saliva that you are expressing, but I also have to admit that there was a closeness and unity that I haven't seen at the typical fundamental celebration of communion in the U.S. However, this was a very small church, with an even smaller group (about 15-20) that showed up for the communion service, which was held separately from any of the main services. That gave communion a special prominence we don't normally experience over here. We even had a light breakfast with fellowship afterwards. My current church almost always takes a whole service for communion, which I think is great, but we do use matzoh bread and the little plastic cups with grape juice. I think the concession to health issues is generally a good one, but maybe we have lost something in the transition to efficiency. Grape juice and wine both have antibacterial and antiviral qualities, but I'm not betting on either one, or a piece of cloth significantly reducing the risk of contracting hepatitis, Epstein-Barr, influenza, or viral meningitis. Perhaps it takes some of the warmth out of the experience, but when it comes to hygiene, I am all for cold, hard efficiency. Good article about individual communion cups. I knew it had something to do with concern for health issues, but had no idea when it began. Louis Pasteur may have invented pasteurization (some of the ancients came awful close), and Welch may have popularized it and used it to preserve grape juice. But the ancients had multiple ways of easily preserving unfermented wine (grape juice) and both Jews and Christians have used unfermented wine in worship for centuries. This is not to say all did, or even a majority did. But you find examples of Christians and Jews (and those of other beliefs) using and preserving unfermented wine since well before the birth of Christ in Bethlehem. The following article briefly gives some of the ancient methods of preserving unfermented wine. On another note, I prefer using matzo and breaking it up into smaller pieces for use in the Lord’s Supper. Jewish matzo can usually be found in larger grocery stores, and sealed in a ziploc® and put in the freezer, it will just about last forever. Of course, the bread should always be unleavened, like the fruit of the vine :-). Interesting article; I have to confess ignorance as to when individual communion cups became the rage. We need some lighter articles to give us a bit of relief. Thanks! By the way, Dan Horn has http://reformingtoscripture.com/store/203_communion/index.html just published a book on communion . I heard him speak last December on the subject and heard some intriguing arguments for the use of fermented wine. One of the most compelling was that Welch's grape juice requires multiple steps to produce, while fermented wine only requires one step -- just crush the grape, stand back, and wait (The yeast is already on the skin of the grape. If you want to see wild yeast in action, just mix four and water, let it sit for a couple days, and it will start to bubble. That's how I make my sourdough starter.). He argued that this one-step process was consistent with the one-step, once-for-all efficaciousness of Christ's blood. I didn't ask him if oaked wine broke the symbolism. occurred less than a generatiobn later with the 1918 Spanish Flu pandemic.